There's a little bit of everything here - up's and down's, roots, sand, rocks, creeks, climbs, and drops. This ride is only as difficult as you make it, because there is so much available back there. The best route is always the one you happen to find yourself on! Review: These trails are great! Review: Turkey Creek is a smaller loop that connects across Briar Creek road to the much larger Malabar Scrub. Both are similar and easy to think they are one trail. I park on Briar Creek and can go to either one (or both). Fun ride. I would say beginner to int. 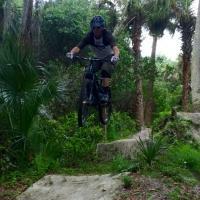 Advanced riders go to Grapefruit trail. Review: A nice trail to get out and put in some cardio. It is not a difficult trail, but the variety of surface and technical sections will help zap your legs. It is a nice beginner trail or a cardio run for advanced riders. The summer is a burner, so get out early or bring lots of water. Review: I really enjoy riding the Red loops. Lots of roots and some elevation change. The Blue trail is pretty decent with q few bridges to cross and challanging with the palmetto roots and some sandy sections. We have been having a lot of rain lately and that is helping the sandy sections be a little more enjoyable. Review: Super sandy 10-mile track that is actually 4 trails combined together. Turkey Creek is the best of the four, but it's still not much challenge-wise. Nice views when riding alongside the creek, other than that, bring a ton of water, 'cause you're spending some time at the beach. Review: Be warned: There are portions of this trail that are still under water from the Aug-Sept monsoon. While they are few, they are not passable and you'll have to turn around. So far the worst areas seem to be the Malabar Scrub yellow/red/white loop and Turkey Creek blue loop, although all are rideable, some sections of each trail are under water. The further south you get, the worst they are. The trail is predominately flat, with a few ups and downs. The surface is mostly sand, with some very loose areas to watch out for. Not a lot of obstacles, aside from a few logs and a LOT of roots, depending on what section you are on. The trail is well marked, although the map is dated, there are a lot of trails that are not mapped, but all are marked. 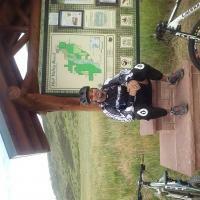 Overall, the trail is fun and the best in the immediate area. There are a few annoying parts, but I'm sure better riders wouldn't have too much of a problem with them. We start riding from the Briar Creek entrance, you can head to a northern section or the southern section. We usually stick to the south/southeast, which starts off as either the red or yellow loop. The yellow loop will ride for about a mile, then dump out at an appt complex, but if you follow the markings you'll find another yellow loop entrance that takes you further back into a lot more trail. The sections here are fairly easy, except for the sand, and without a lot of technical aspects. The section back there can be hairy to navigate, so bring a compass and keep track of where you are, realizing that you may be in another sanctuary. The red loop leads to the more technical areas, mainly the (relatively) short red loop and the bridges to the blue loop. The red loop isn't terribly difficult, there are a few ups and downs and a lot of roots. The blue loop, which is reached via the red loop, has the most difficult terrain we've encountered on the trail so far, mainly because of the roots. There are several branches of the blue loop, but be warned that some of them currently lead to impassable swamp. Lastly, watch for wildlife. The turtles like to sit in the middle of the trail and stare you down. Review: Though not terribly difficult, Turkey Creek is the crown jewel of the connected trails in the area in my opinion... Though they are not very long the trails are scenic, flowy, sometimes tight single track along Turkey Creek itself. Some ups and downs and switch backs. A few little root/log hops or small log ramps. Some tight jungle like areas, so generally good cover in the Florida sun. Watch the palmetto roots often hidden by vegetation, they can take you down Gets really tight in places, so get used to riding thru outreaching palmetto branches and various bushes, but nothing that bad and kind of adds to the experience. A real Florida trail ride experience. You can make a great morning by riding all the trails there together... Turkey Creek, Malabar West, Cameron Preserve, and Malabar East. Sand really isn't an issue overall... and Malabar East seems to have most of it. 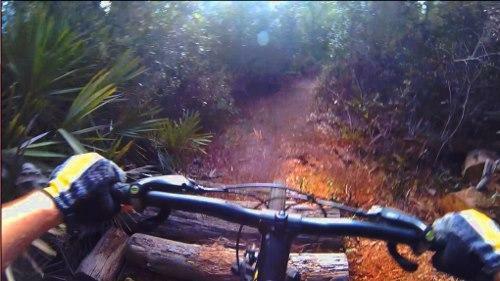 Review: Nice easy flowy trail no major obstacles or elevation change plenty of saw palmetto trunks. It's been raining so trail was fast although seems like a lot of sugar sand when dry. I had fun and would definitely ride here again if in the area. Review: I road all 10 miles of the trail systems. I would rate it easy/ intermediate. It's a very beautiful trail and well maintained. Review: I am very spoiled by the beautiful trails in NC where I live, but figured I would check out the local trails here while in town. This trail system is set up pretty well and makes for a couple of TIGHT single track loops. When I say tight, I mean like not even wide enough to pull over or pass anyone, and the turns are very tight. This is complicated by the fact that much of the ground is sand, so conventional leaning into turns is pretty much out of the question. Overall I think that the trails are well thought out, well labeled and fun to ride. Thankfully there is a good covering over much of the trails, so the hot Florida sun is not beating directly down on you. There are some cool bridge areas over some wetland areas too. I started to go over to this "scrub" area (I forget what it was called), but the sand was deep and like a cross between regular and powered sugar. Almost impossible to pedal through. Kudos to the trail maintainers for having a nice little trail system in the area to ride. Turkey Creek MTB Trail 3.69 out of 5 based on 44 ratings. 44 user reviews.